It is believed that turtles evolved from land dwelling creatures similar to tortoises? One theory for this change is that they were spending more and more time in the water, in order to survive the event that wiped out the dinosaurs. The only dependency they still have on land is to lay their eggs. In April 2011 eighteen illegal immigrants were amongst the first residents of a new refuge for freshwater turtles to arrive at the Scottish SEA LIFE Sanctuary. 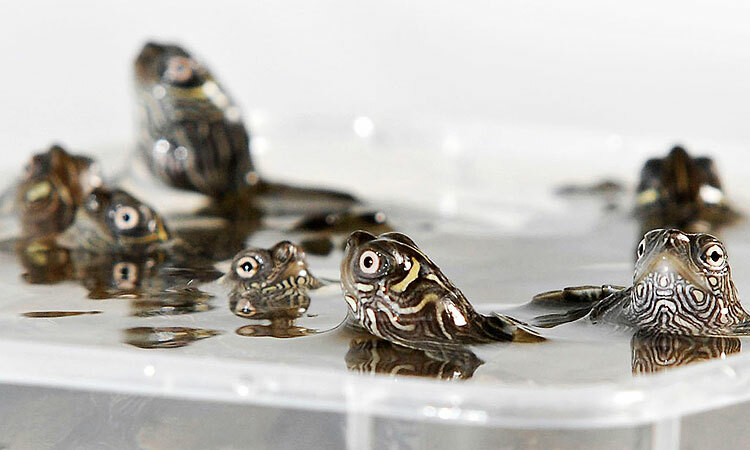 These Mississippi Map Turtles that are not endangered but that arrived in the UK without the correct papers and were confiscated by Customs officers. Here is a selection of photos of some of the exotic animals from around the world in the Turtle Sanctuary. Click here or on the image below of your choice to see larger photos and to learn a bit more about these weird and wonderful creatures. Conservation of Turtle Nests - All species of marine turtles are threatened with extinction. One of the biggest threats to their extinction is the continuing loss of their nesting habitat. It is believed that marine turtles have an extremely high affinity for their nesting beaches and will return to them time and time again. Click here to read more. The Scottish SEA LIFE Sanctuary have been called upon to help in the rescue and rehabilitation of sea turtles around the coast of Scotland. Click here to find out more about the rescues of turtles in the wild.